Meant to Be Shared features nearly two hundred 18th- to 20th-century Italian, French and Spanish prints. These works were avidly collected by philanthropist Arthur Ross (1910 – 2007), given to Yale University Art Gallery in 2012 and subsequently organized for this exhibition. Ross frequently lent to museums, especially those on academic campuses. In the spirit of the collector, Meant to Be Shared travels to the Harn Museum and Syracuse University Art Gallery. 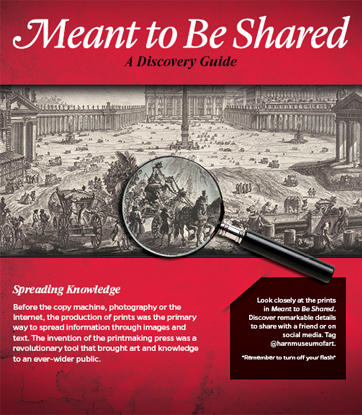 Highlights of Meant to Be Shared include entire series of works by Francisco Goya, views of 18th-century and ancient Rome by Giovanni Battista Piranesi, Eugène Delacroix’s illustrations of William Shakespeare’s “Hamlet,” and Édouard Manet’s illustrations of Edgar Allan Poe’s famous poem “The Raven.” Other artists represented in the exhibition include Honoré Daumier, Edgar Degas, Paul Gauguin, Paul Cézanne and Pablo Picasso. Meant to Be Shared: Selections from the Arthur Ross Collection of European Prints at the Yale University Art Gallery is organized by the Yale University Art Gallery. The exhibition is made possible by the Arthur Ross Foundation with local support from the Harn Program Endowment Fund, Visit Florida, Robert and Carolyn Thoburn, Yale alumni Donald Caton with his wife Cecilia, Roy Hunt, Consuelo Soldevila-Pico and an anonymous donor. Take a closer look at the history and art of printmaking in this digital guide to the exhibition Meant to Be Shared: Selections from the Arthur Ross Collection of European Prints at the Yale University of Art Gallery. Printed copes are available for everyone at the Harn's Visitor Services Desk located near the museum's entrance. 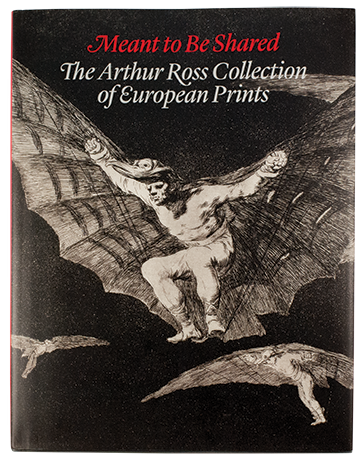 This fully illustrated catalogue offers an in-depth look at the Arthur Ross Collection of Italian, Spanish and French prints. It includes works by master artists such as Francisco Goya, Giovanni Battista Piranesi and Édouard Manet. This book was crafted by the Yale University Art Gallery in celebration of Arthur Ross' belief that these art works are "Meant to Be Shared" with everyone. "What Mrs. Flaxman Saw … A First Hand Perspective on the Grand Tour"
"Etching Enlightenment’s Demise: The Print Series of Francisco Goya"